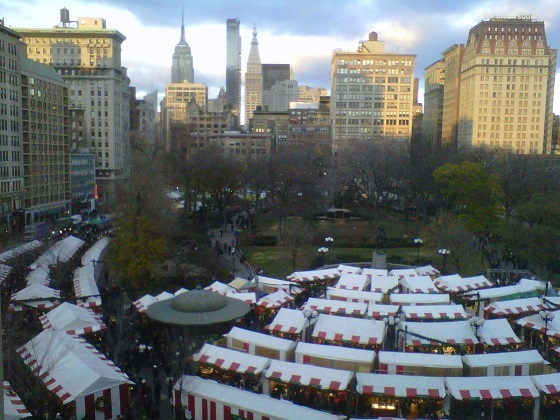 After a great dinner at 3Guys we took a trip into Manhattan to visit the Union Square Greenmarket and Eataly. We went in having no idea what we wanted to make for dinner but we had a cooler, a cart, many bags, and money so we were sure to leave with something good. At Union Square we ended up with all sorts of treats: two 2 lb boneless leg of lamb roasts, smoked duck breast, daikon radish, many different apples, yukon gold potatoes, fresh local cheese (I forget the name unfortunately), shallots, oyster/crimini/shitake mushrooms, rosemary olive bread, wild eggs (duck, turkey, and pheasant) and a great goat cheese. Quite the haul but it set the foundation for an excellent lamb dinner. It’s not quite produce season yet so there weren’t as many fruits and vegetables as usual but the duck, chicken, rabbit, cheeses, and honey looked excellent. 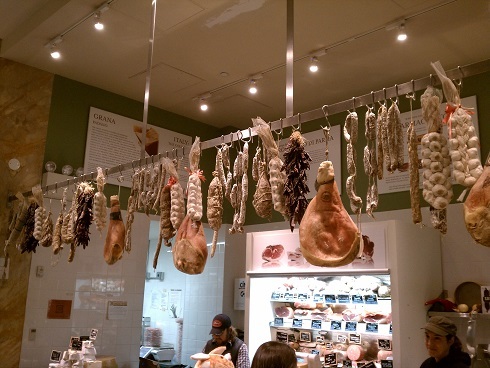 Having never been to Eataly no one was sure what to expect but we were all pleased once we arrived. It’s basically a huge warehouse converted into a hybrid Italian market and restaurant. Tons of stands selling a variety of classic Italian fare, a wine shop (over-priced but fun), shelves pre-packaged items like cookies, balsamic vinegar, spreads, and coffee. 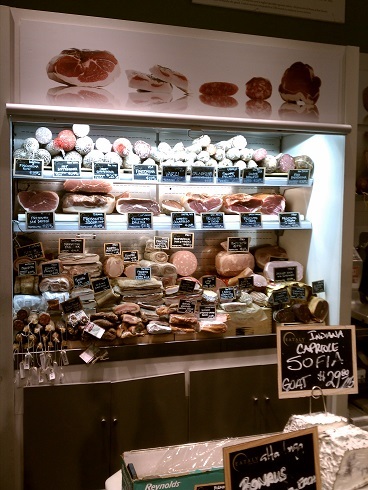 We of course gravitated towards the cured meat and cheeses. We ended up purchasing some great food: wild boar salami, sheeps milk cheese, fresh herbs, Italian cookies, pistachio cream spread, and anchovy juice. Moby, SisterGrape, CousinGrape, and I enjoyed an espresso at the bar before having lunch at one of the stations. Moby and I split a prime rib sandwich while Uncle and AuntGrape had the fennel turkey. Both on crispy bread with olive oil and salt piled high with freshly roasted meat. They had fresh pasta, seafood, meat, sandwich, and desert stations throughout the whole place as well. We expected more of a market and were a little surprised at the amount of serving stations. 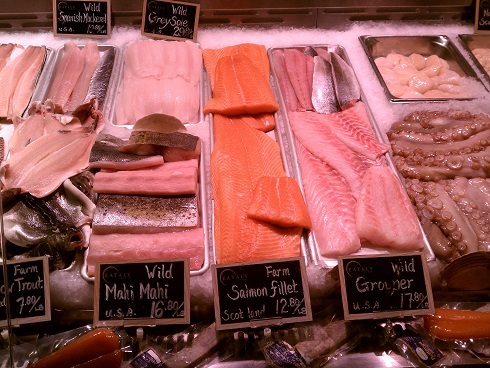 Lastly while we didn’t get any seafood items the counter looked spectacular…next time you’re in NYC and looking to cook stop at these two markets for ingredients. This entry was posted in United States, Wine Dinners on April 7, 2013 by colonelgrape.